It’s one of the most recognizable and beloved cars in cinematic history and this year, it turns 55 years old. However, it’s the 30th Anniversary of Ghostbusters this summer that has shined the Slimelight back onto the original Ecto-1. Beyond the Marquee was recently given an opportunity to check out the Ecto-1 at Sony Pictures Studios and we brought along a special guest who hadn’t seen the car in a long time. It’s a reunion 30 years in the making as Beyond the Marquee interviews the designer of the original Ectomobile, Stephen Dane! If you were ever given a chance to look at the resume of designer Stephen Dane, you’d probably be surprised to receive 8-pages worth of information. While that resume length may seem extreme to most people nowadays, in this case it’s absolutely necessary to help sum up the career of a man who has worked on some very impressive film, TV, and theme park projects throughout the years. At the very top of that list is Ridley Scott’s highly-regarded, Blade Runner (1982), for which Stephen’s name is very well known to fans of that film. He’s also had his hand in quite a few television shows including The Dukes of Hazzard, AirWolf, SeaQuest, Quincy, and BJ and the Bear (anyone remember that one?) Well-known films such as The Electric Horseman, More American Graffiti, Red Dawn, The Adventures of Buckaroo Banzai, and Home Alone 2 also bear Stephen Dane’s creative mark. Aside from the film and television work he’s done, Stephen has also been involved in the construction of many theme parks and attractions throughout the world. 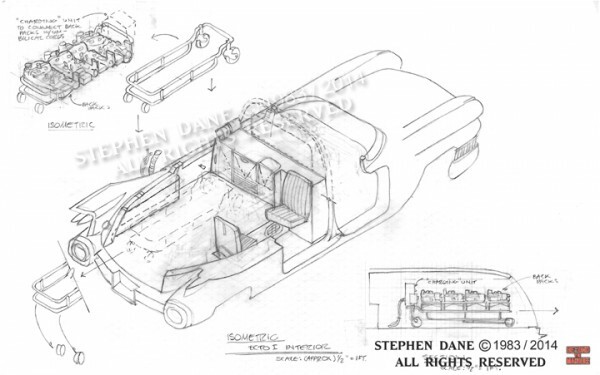 If you’ve ever taken a ride back in time on Universal Studios’ Back to the Future: The Ride, you’ve no doubt been exposed to a lot of Stephen’s design work as he was responsible for much of the look of the ride interiors, props and the building that contained it all. 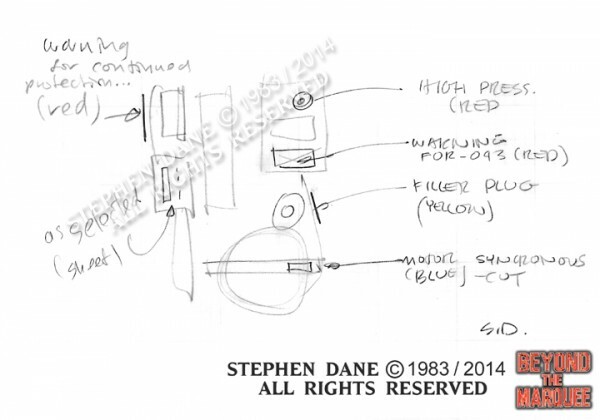 It was in 1984, however, that Stephen Dane was given the obscure screen credit of ‘Hardware Consultant’ along with a misspelling of his first name. That credit tends to hide the fact that he was the man responsible for designing one of the most recognizable movie cars in cinematic history, the Ghostbusters Ecto-1 Ectomobile. Working one-on-one with the director of Ghostbusters, Ivan Reitman, Stephen helped design some of the most popular and memorable movie props of all time…and he and a crew of prop builders only had six weeks in which to accomplish the task! 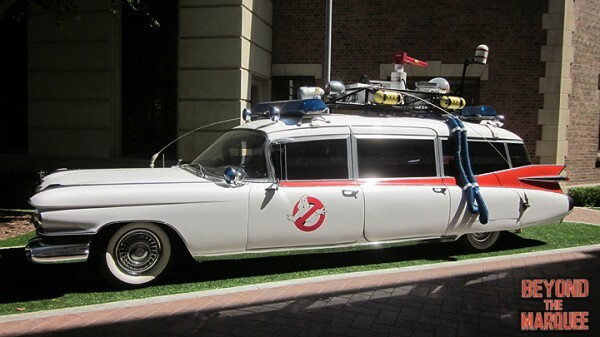 With the 30th Anniversary of Ghostbusters this summer, Beyond the Marquee was provided a great opportunity to head down to the Sony Pictures Studios lot in Culver City, CA to take a good look at the original Ecto-1 car. In 2009, Sony shelled out over $50,000 to completely refurbish the car after years of neglect had left it almost unrecognizable. The end result was a stunning transformation back to the car that everyone remembers from the 1984 film and it was a lot of fun for our crew to receive unlimited access to it. While in preparation for our shoot at Sony, the question of, “who really designed this car and where are they now?” came up. To make a long story short, Beyond the Marquee called in a favor to our good friend, futurist Syd Mead, and within less than a day we had found Stephen Dane and invited him to join us at Sony. Stephen was thrilled at the opportunity to revisit the car he designed 30 years ago and his colorful personality and excitement could not be contained. Talking to Stephen about his career is like opening Pandora’s Box. Discussion of one film leads to another and you quickly realize that the man has more stories than you can possibly document in one sitting. We thought we had covered a lot during our BTM: The Web-Series interview with him at Sony, but we realized very quickly that we’d only scratched the surface of what he could tell us about his involvement in working on Ghostbusters. So, we took the time and sat down with him again, cameras off, and allowed him to talk and fill in the blanks about an amazing 6 weeks of work in 1983. 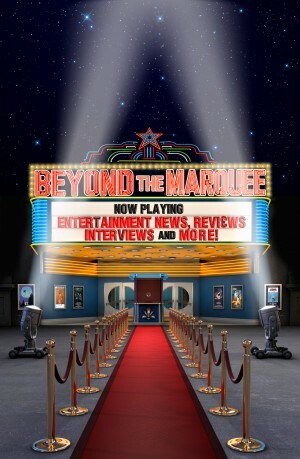 BTM: How did you get your start in the Hollywood design industry? SD: I was born into the Hollywood culture. 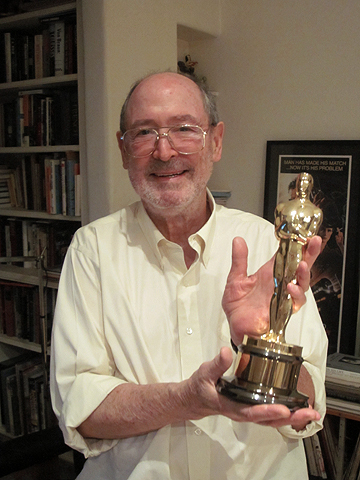 My father was a Publicity Agent for 20th Century Fox and my mother was a Costume Designer who worked on several prominent films including, The Ten Commandments. She received 3 Oscars for her work on the films, Joan of Arc, Samson and Delilah and Night of the Iguana. For two years, I studied at Santa Monica City College, worked part-time at Life Magazine and took illustration classes with Douglas Aircraft over at the Santa Monica Airport. That was where I really learned how to draw 3D isometrics and exploded views of parts and equipment. After that I spent two years at Bard College in the Hudson River Valley as a literature major and then finished out at the University of California in Berkeley with a professional architecture degree. After I graduated from Berkeley, I worked in San Francisco and Los Angeles (my second job out of school was with Frank Gehry). I worked for 7 years in architecture until it slowed down in the ’73 recession. Then I came down from the Bay Area to work on a store interior in West Hollywood. I heard they were hiring people at Universal Studios to do period architectural design for their theme park in Hollywood and that led me into the movie business as a Set Designer and Art Director. Several years later, I was the Assistant Art Director on Blade Runner doing Key and Action Prop design and build supervision. I also did Vehicle Design including Construction Supervision for the film on the studio backlot. In 1982, I worked on both Brainstorm and The Adventures of Buckaroo Banzai doing key action props, vehicles and design. I supervised the building of the practical Jet Truck for Buckaroo and really had a fun time with it. In 1984, I worked on John Milius’ Red Dawn designing the Russian jet helicopters. Throughout 1983 and 1984, I was a Design and Hardware Consultant specializing in key vehicles as well as various action props. BTM: What led you to working on Ghostbusters? SD: I got the job on Ghostbusters because of the work I had done on Blade Runner, Brainstorm, Buckaroo Banzai and Red Dawn. When Ivan Reitman discovered he only had a few weeks to build the Ecto-1 ambulance for the New York shoot, he asked around for someone and my name came up. I went in for an interview, showed him my portfolio and got the job! BTM: Your title on the film is ‘Hardware Consultant.’ What exactly does that title represent in terms of the work you did on the film? 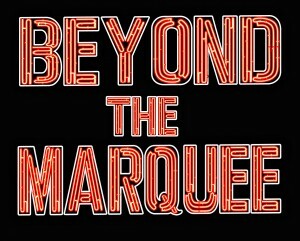 BTM: What were you initially given from the production team and Ivan Reitman in regard to sketches, ideas, scripts, etc. 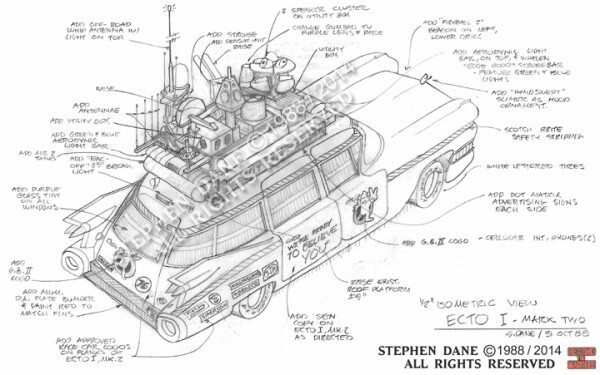 that gave you the inspiration to draw up the plans for the Ectomobile and Ghostbusters equipment? SD: I came into Ivan Reitman’s office cold and didn’t know just what to expect. 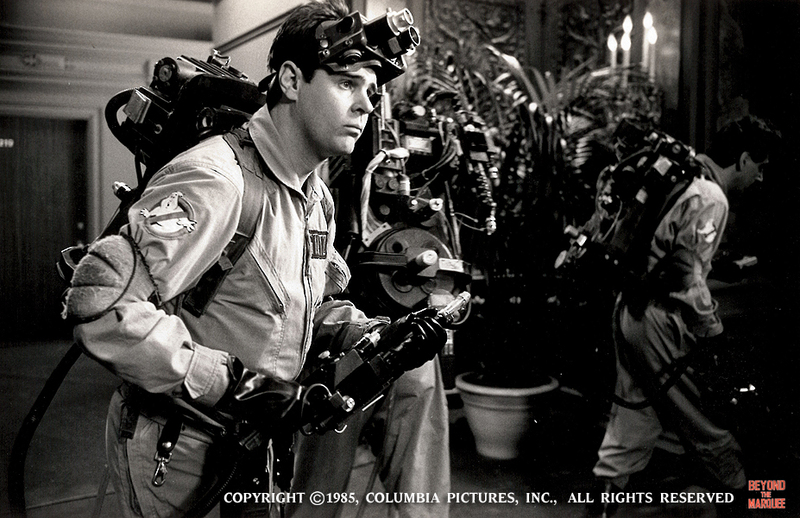 They told me what they needed in props like the Proton Pack, Neutrino Wand, Ghost Trap and, of course, the Ecto-1. 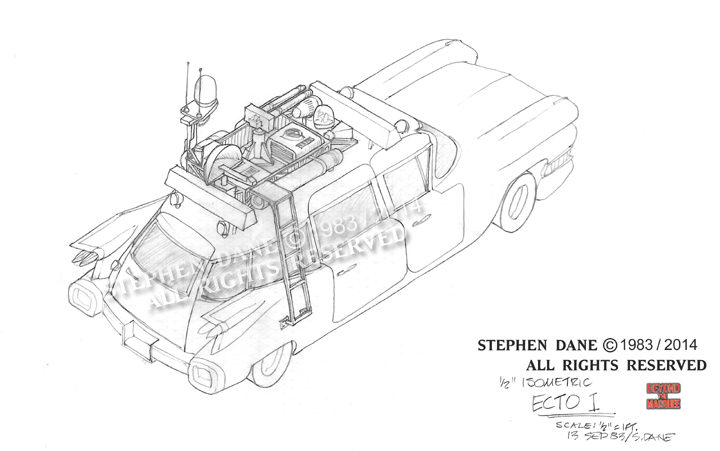 John Daveikis, who I share a credit with, had done some initial Ecto-1 ideas with Dan Aykroyd. He also designed the “No Ghost” logo which I inherited. 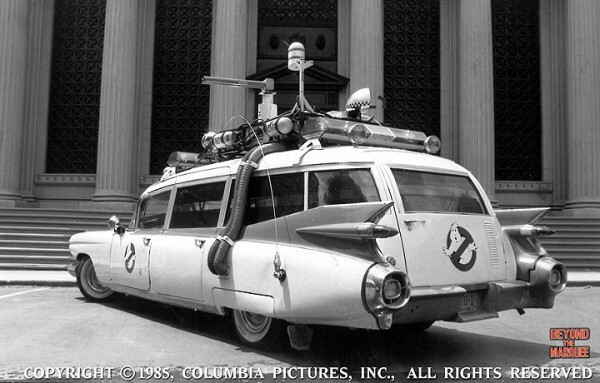 The inspiration for the Ecto-1 and the Ghostbusters equipment came mainly from Ivan’s descriptions of what he wanted and the references in the script. I would go home (about 4 or 5 miles away from the studio), draw up the ideas then go back to Ivan pretty much the next day. It was a very fluid relationship allowing us to pin down the design of the various props as well as the overall look of the Ectomobile. BTM: What was it like working with Ivan Reitman? SD: It was wonderful to work with Ivan. He would discuss what he wanted and I’d sketch it up. He was very accessible at all points from concept through fabrication. He would tell me his ideas and I’d draw them out for him, get his approval, go out and gather parts and then make up some of the rough mock-ups of props and oversee the build on the Ecto-1. I worked with Ivan very closely throughout the entire design process. 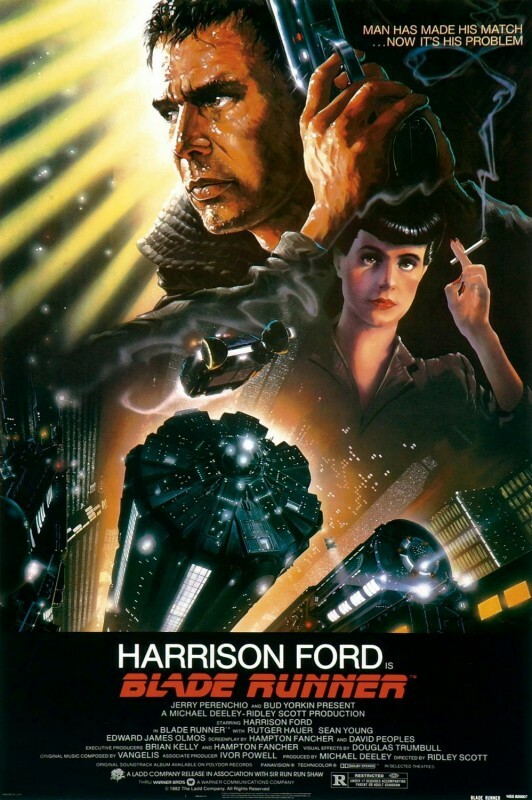 The only director other than Ivan Reitman that I enjoyed working with on developing ideas was Ridley Scott during the production of Blade Runner. BTM: What were your inspirations for designing the Proton Packs? SD: The backpacks were always in play script-wise. Ivan and I had an early conversation and he told me what he wanted. 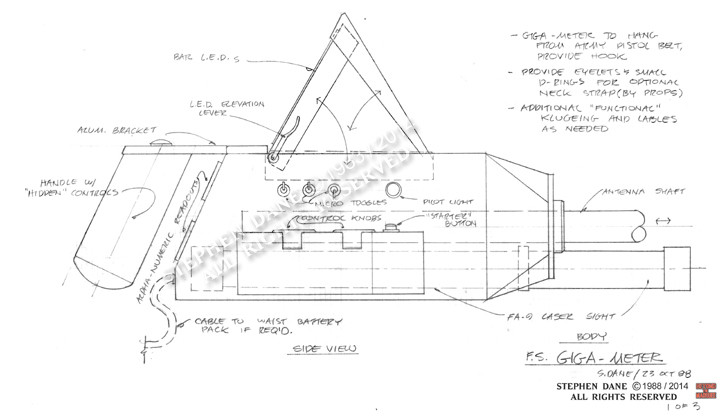 I then drew up some rough sketches based off flamethrowers I had seen in a few military magazines. Once I had a basic idea and shape, I went out and got a pack frame from California Surplus on Santa Monica and Vine in Hollywood. I ended up building a rough mock-up based on what we had discussed and what was in my early designs. I presented the backpack mock-up to Ivan and we further talked about refinements and from there it went to the prop builders. BTM: Do you recall who physically fabricated the screen-used Proton Packs and Ghost Traps? SD: I can’t recall who supervised the final building pass on the Proton Packs, the Neutrino Wand and the Ghost Traps. I was mainly involved in buying parts and guiding the prop fabricators in constructing several of the early mock-up designs. Even the finished Proton Packs seen on screen had a rough surface on close-up inspection since there wasn’t enough time to make them perfect and smooth. The prop builders did a great job of building the screen-used Proton Packs considering they had to build several packs and wands in such a short amount of time. As rough as the backpacks were up-close, the Neutrino Wand was very nicely detailed and you can see that in the film. I can see detailing that I don’t recognize as my own. The Ghost Trap was in the script and Ivan and I discussed it. I did some early sketches that he liked and went home and perfected the design. It became a reverse bomb-bay — instead of something coming out of the open bomb-bay doors, something got sucked in. I do recall going out and buying parts for the Ghost Trap at one point…the doors, I think, although I could be mistaken. BTM: About how long of a process was it to go from your first designs on paper to seeing the final Ghostbusters equipment and Ecto-1 completely built before shooting began? SD: When I did the interview on camera with Beyond the Marquee at Sony, I may have been a little off on the time frame in saying we built everything two weeks before filming. The two weeks time frame I mentioned really only applied to the build of the Ecto-1, so I was somewhat accurate. 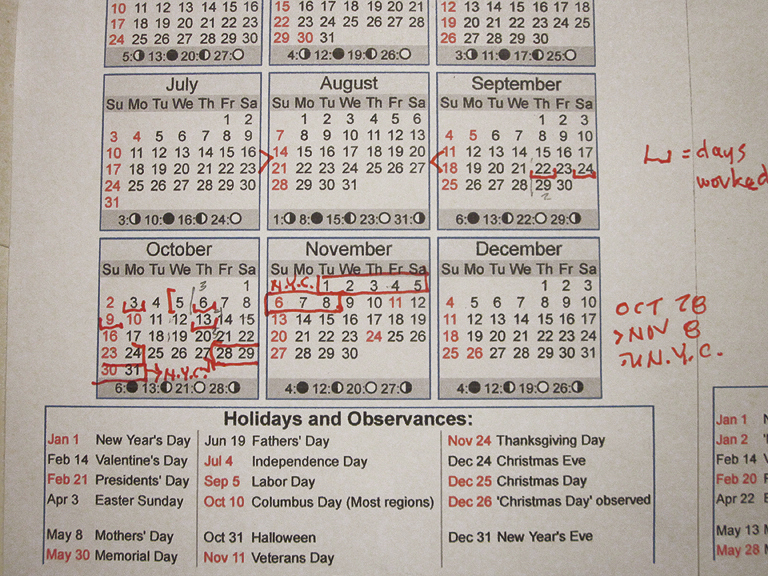 Since filming that interview, I was able to look into my archives and get more accurate dates for everything. It’s been 30 years, so my memory may not be 100%, but generally speaking, the overall time span from start to finish was about 6 weeks. This meant we had 6 weeks to get all the props and the car fully designed and built before shooting started in New York. That’s not a lot of time when you’ve got several things being designed and built all at once and, up until that point, no one knew who was responsible for building what. 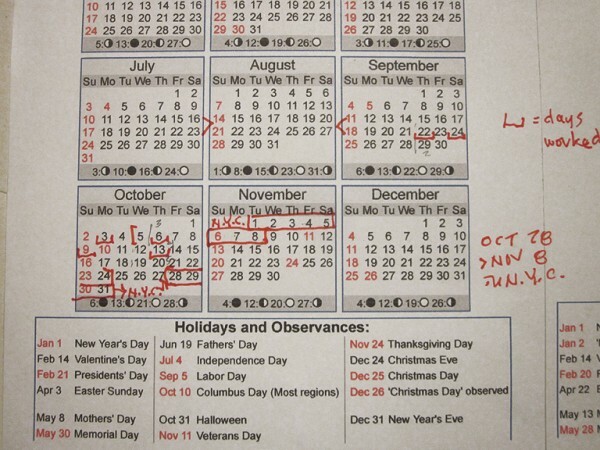 I kept a calendar of the days I worked and also have many of the purchase orders for the parts I was acquiring at that time and I was able to put together a time frame from those. I started working with the production on September 22, 1983 and initially was a one-man show doing sketches of the props and purchasing parts which would eventually lead to several mock-ups that were brought to Ivan. Ivan and I were working one-on-one every step of the way. A lot of the design and build processes overlapped. We had many things going on concurrently just so we could get it all done on time. 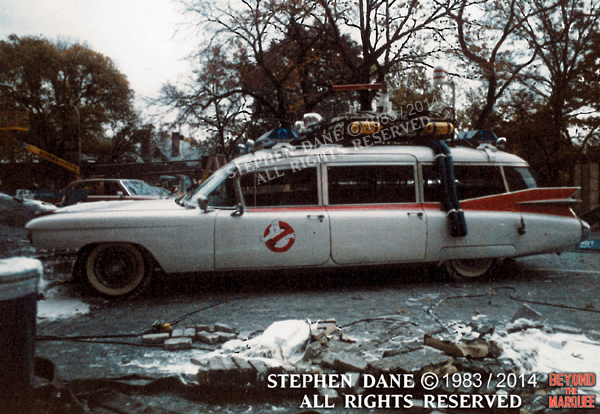 I pretty much remember the overall schedule as being concentrated on the props, then the Ecto-1, and then back to the props. 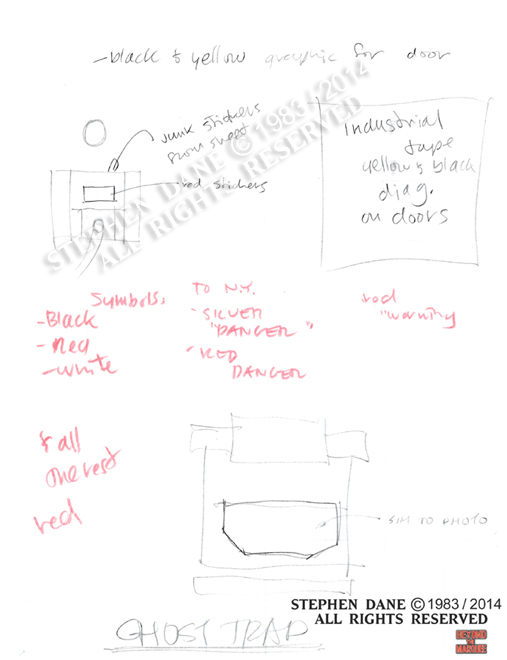 9/22 – Started sketching and buying materials for the Neutrino Wand mock-up. 9/24 – Started buying materials and parts for the Proton Packs mock-up. 10/5 – Measured the ambulance and began sketching isometrics to turn it into the Ecto-1. 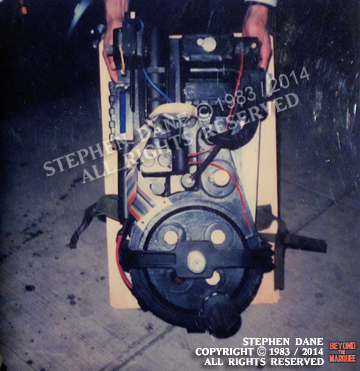 10/6 – Bought frame for the Proton Pack mock-up. 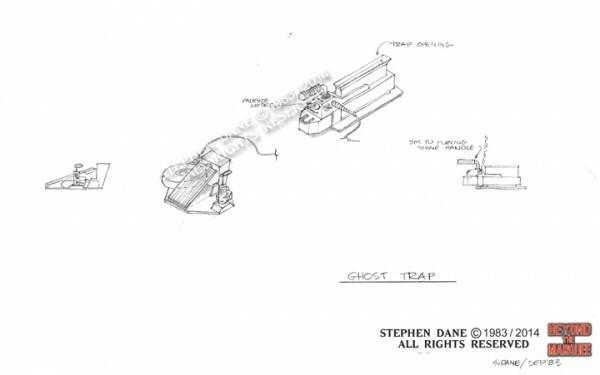 10/17 – Bought materials for the Ghost Trap. 10/19 – Ecto-1 is shipped to New York City fully painted, but without the roof rack. 10/22 – Purchased graphic prop materials to take to New York. 10/27 – I fly to New York. 10/28 – First day of shooting. 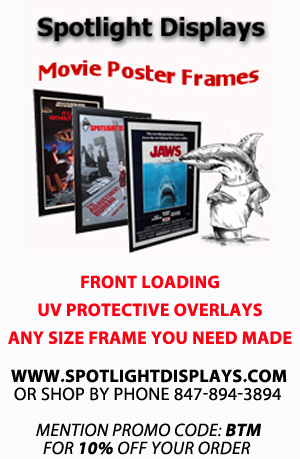 10/28 thru 11/8 – ‘On-call’ to finish work on the props and the Ecto-1 and any additional design/prop needs during filming. 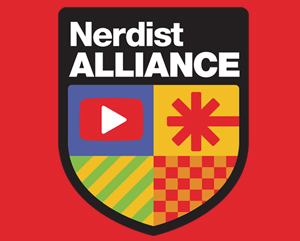 11/8 – Wrapped my work on Ghostbusters and returned to LA. BTM: Can you further explain the design and build process for the Ectomobile? 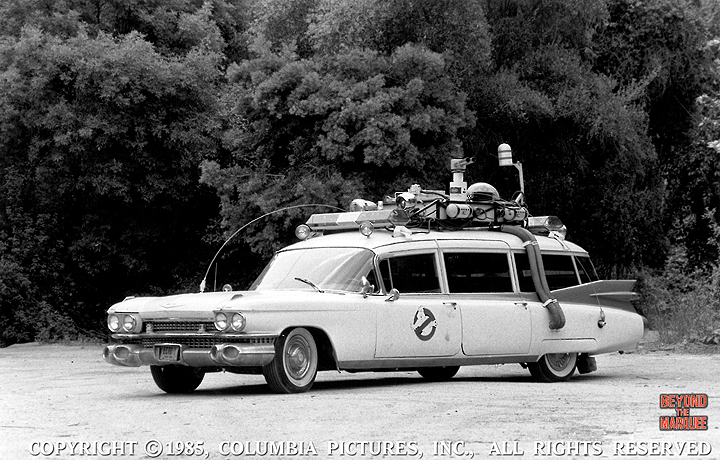 SD: On October 5th, about two weeks in from when I started with the production, I began working on the Ecto-1. I had nothing to do with the picture car purchase or selection. Same thing goes for the backup primered hearse they rented. 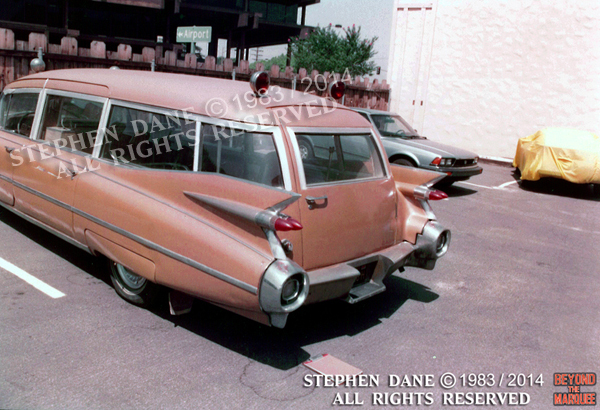 The first time I saw the key ambulance, it was already sitting on the backlot at The Burbank Studios. I took reference photos and measured it and then brought that information home to draw up isometrics and its various views and elevations. 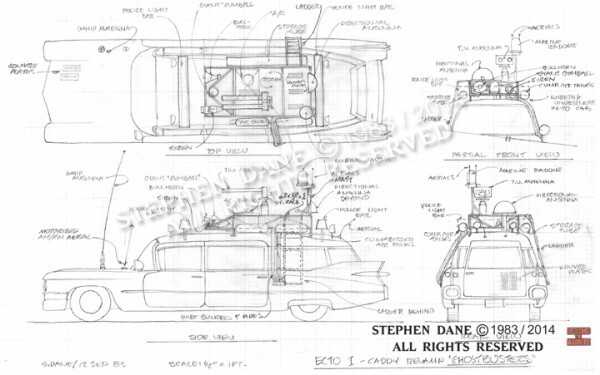 Out of all the things I was designing for the film, the Ecto-1 took the longest amount of time. Once the designs were approved by Ivan, it went to the prop makers over at the studio Mill for its iconic Ghostbusters paint scheme and detailing. It did take about two weeks to block out the paint job and details on the car like the logos and small parts. They also had to get it in driving condition and have the interior cleaned up and filled with equipment before it was ready to ship to New York. It was sort of half done before it shipped. I think I also ended up acquiring several of the parts that were put on the roof rack, so I definitely did my share rather than just direct the prop guys in building the car based off my plans. We shipped the car out to New York City on October 19th so it could get there by October 28th to be ready for the first day of shooting. It took about a week for transcontinental shipping and I recall that we put it on a train because the car was much too big to fit on an airplane. Back in 1983, they didn’t have planes that were large enough to hold it. Nowadays they could, but back then they really didn’t have that ability and it would have been too expensive anyway. I just know that one day the Teamsters picked the car up from the studio and the next time I saw it, it was in New York. The roof rack was flown to New York separately and was connected to the car there just before filming began. I think it took a day or two to get the roof rack attached with some finishing touches done and Ivan Reitman may have requested additional details as well. The prop guys in New York were the same guys from LA and they were fully informed on how it all went together. I oversaw the work, but it was those guys who finished the car pretty quickly as it had been all figured out ahead of time. Some confusion still exists about the extent of the work I did on the car. Although I did closely supervise the building of the Ecto-1 before it was shipped to New York, I did not physically build or paint any part of it. As I mentioned, it was the studio painters and the prop makers at The Burbank Studios Mill (now under the Warner Brothers name) that put it together. I did the fully detailed plans and elevations of the interior and exterior as well as detailed isometric drawings of the car and roof rack and then oversaw its construction, painting and acquiring of various parts. It was a very hands-on involvement without really touching the car. BTM: Were there a lot of changes from your designs on paper to what was eventually built and seen on screen? SD: Yes, there were changes, but they were usually very subtle and I’m probably the only one who notices them. 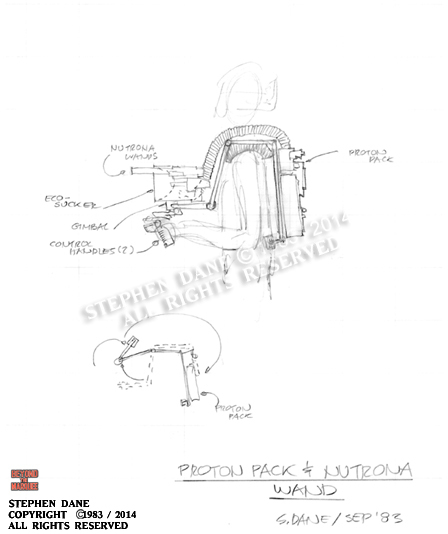 If you look at my sketch for the Proton Pack gurney in the Ecto-1, you’ll see that I designed the packs to lay sideways. The guys who built the car changed that and what you see in the movie are the packs positioned upright and at a slight angle. There were also parts on the roof rack that changed position from what I had in my drawings. Everything is still there, but some of the parts may be on top of each other or facing in a different direction. As I mentioned before, the detail on the screen-used Proton Packs and Wands eventually included details that were a surprise to me when I saw the movie. Those changes were made not because of conflicts in design or disagreement with my sketches. The prop fabricators had to do what worked just to get the things built, just to get the job done. 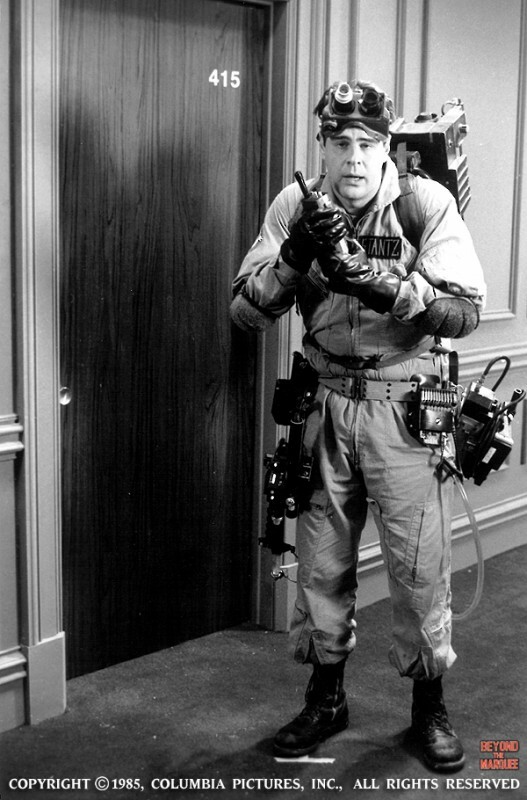 BTM: Did you do any redesign on the Proton Packs or Ghost Traps for Ghostbusters II? What new equipment did you design? SD: There was just a little revisional detail work on the existing Proton Packs and Ghost Trap in addition to a complete redesign on the Ectomobile, making it into the Ecto-1A. The new equipment: Giga-Meter, Slime Scooper and the Slime Blowers (a huge tank connected to a handheld Slime Nozzle), were all designed by me. 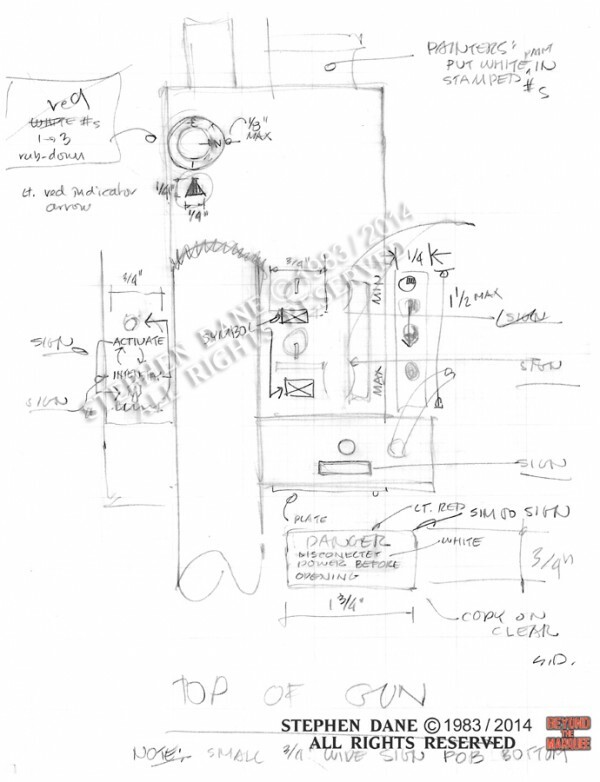 I worked off the script references of the equipment and had design development meetings with Ivan Reitman. I made a good set of scaled isometric images for the prop makers to build from once the designs were approved. One of the nice touches for the props on Ghostbusters II came from my saving a large amount of left-over warning labels and symbols from Blade Runner. I used these labels to quite an advantage in that it made our new props look more authentic. 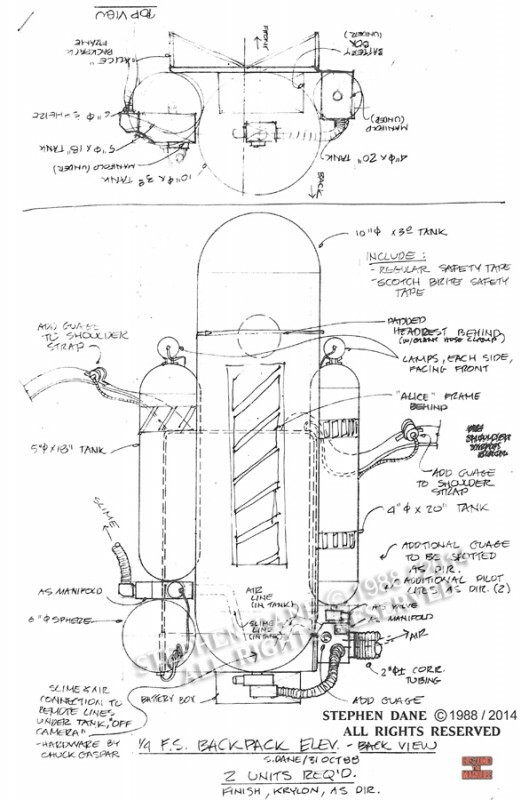 BTM: Throughout the years, many of your sketches and designs have found their way onto the Internet either by legitimate or illegitimate means and used as templates for Ectomobile and prop reproductions. Most recently, several of your original sketches and photographs were sold in a public Hollywood memorabilia auction without your knowledge. Does it bother you that so much of your work is being passed around freely with nary a credit to you? SD: I’ve gotten used to these “Parasites” ripping me off. Since I can’t control or influence these sneaky people, my only comment is, “What’s the difference between a thief of original artwork and a mosquito? One is a blood sucking parasite and the other is a small flying insect. People who make money by selling or sharing something that I’ve created are thieves. They’re benefiting without sharing with the original author and it is nothing more than simple theft. As for fans of Ghostbusters who build their own equipment including costumes, Proton Packs, Ghost Traps and Ecto-1’s, I think it’s great and an honor! I encourage it and when I see it, I consider it an homage to my own designs. People that make an effort to create things for themselves and their own enjoyment, just because they enjoy Ghostbusters, is an entirely different thing from stealing someone’s work and not giving credit. 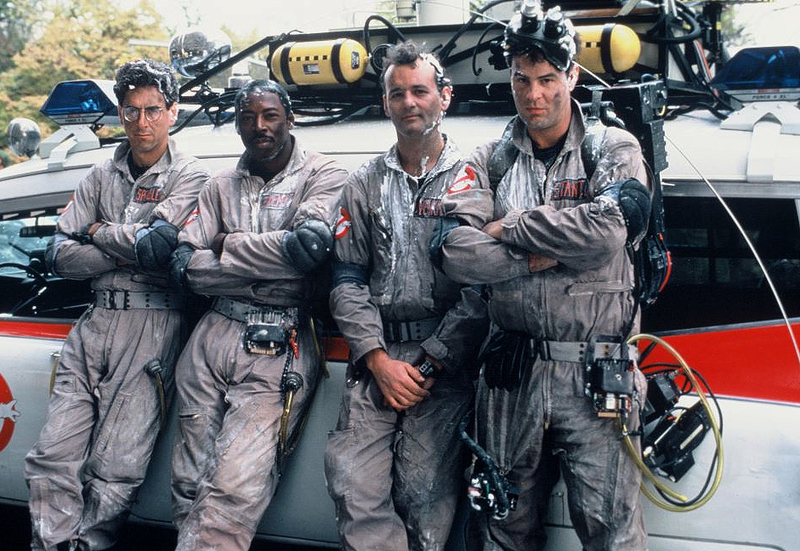 BTM: What are your thoughts on the much-rumored Ghostbusters 3 ? SD: I haven’t thought about it at all because I never heard anything definite about it. BTM: Do you have any special memories of working on Ghostbusters? 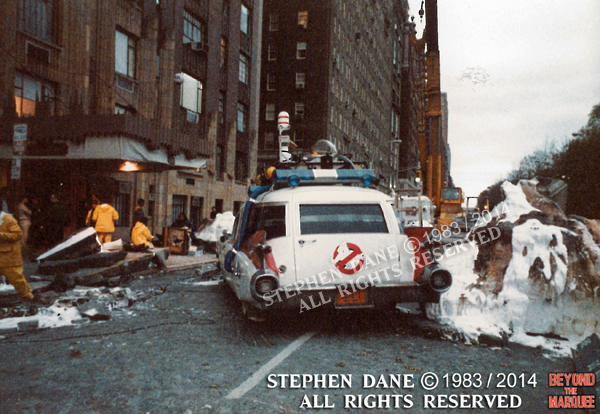 SD: My favorite memory from Ghostbusters happened when they were shooting downtown near City Hall on lower Broadway in New York. 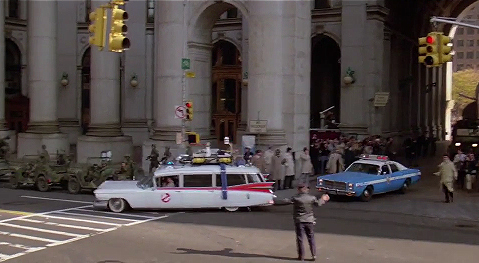 I was walking west on Park Row towards Broadway just south of City Hall and saw the Ecto-1 roll by as it was driving out of a shot for the film. The four occupants in the car were Dan Aykroyd, Harold Ramis, Bill Murray and Ernie Hudson, and they all waved at me and I waved back. It was a priceless moment that I’ll never forget. BTM: What impact did the original Ghostbusters success have on your career? SD: The biggest impact of working on Ghostbusters was that it became a very prominent film credit on my resume and provided momentum for a healthy design career. 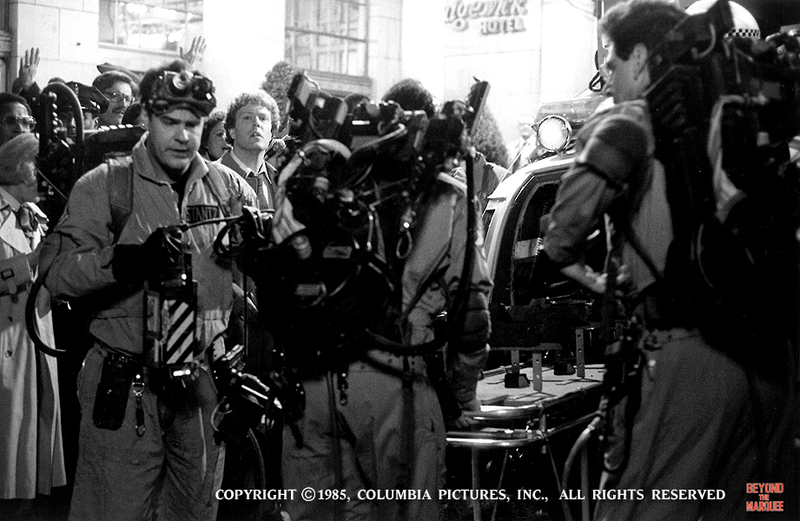 I was delighted to contribute to the Ghostbusters franchise and be a part of Ivan Reitman’s crew. If I could say anything in person to Ivan today, I’d thank him for including me in his production and shake his hand while looking him in the eye. BTM: Have you retired or are you still working today? 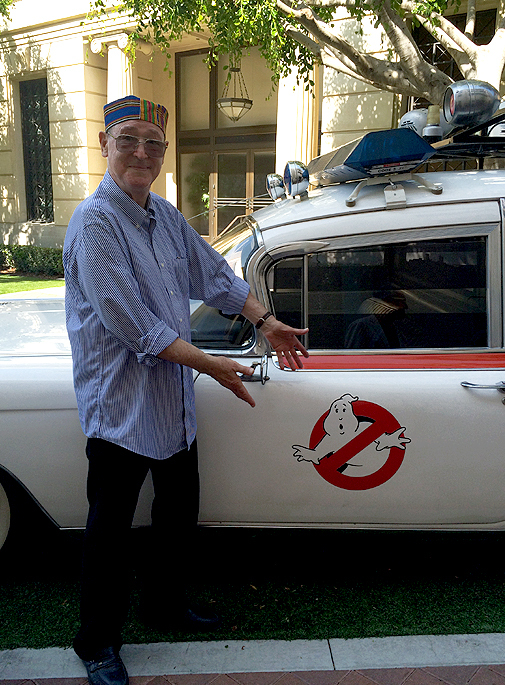 Stephen Dane reunited with the Ecto-1 30 years later. SD: I retired from the movie industry about ten years ago after working on Ladder 49 in Baltimore, Maryland. Six years ago, I worked as an Art Director on a theme park to be built in Abu Dhabi. Over the last decade, I’ve done house designs that were built, landscape plans and many other projects to keep busy. 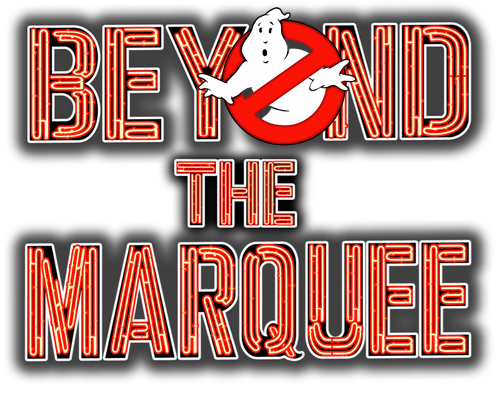 Beyond the Marquee has some fun on-location at the Ghostbusters Firehouse in LA. This was an awesome article – thanks guys! Thank you for this interview. A smart producer should have hired him as production designer on a show like Max Headroom, and then maybe more genre fans would know his name and work. 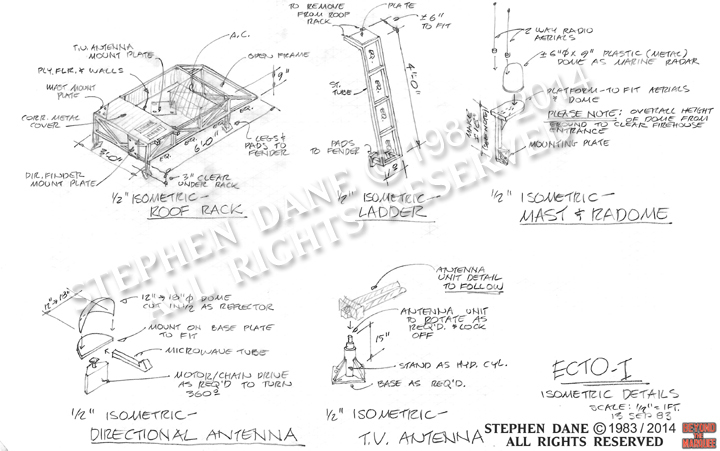 Please consider another interview with Stephen about his work on Buckaroo Banzai in the near future. Would love to know if he did any design work for the proposed Heroes for Hire television series from the creators of Buckaroo Banzai. Heroes was considered by ABC before the network produced Max Headroom instead.